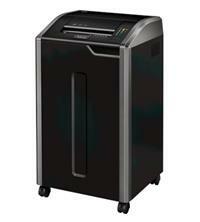 The Fellowes Powershred 425Ci Cross-Cut Shredder is designed for heavy commercial use, perfect for 10+ users in a shared work area. It features durable materials including a continuous run motor (no cool down period required), precision die cast gear box, robust chain and solid steel cutters. The shredder has a very large sheet capacity and will shred 28 sheets of 75gsm paper into cross-cut pieces measuring 4 x 30mm. This gives it a P-4 security rating, ideal for highly confidential shredding. The waste bin is 121 litres and the shredder can handle staples, paperclips credit cards and CDs/DVDs - so no need to spend time prepping paper before shredding. Casters mean you can easily move it around the office when you need to and the shredder comes with a host of other features including: a 100% Jam Proof System which prevents paper overloads by signalling if you are trying to put too much paper through at a time (it also powers through misfed paper to help prevent jams); Safesense Technology which stops the shredder immediately when hands touch the paper opening; an Auto-Oil system which lubricates the cutters automatically, helping to enhance shredder performance and extend its life (simply change the oil bottle when prompted to keep the oil topped up); and an Energy Savings System to create optimal efficiency (includes standby mode and sleep mode which is triggered after 2 minutes of inactivity). Paper entry width on the Fellowes Powershred 425Ci Cross-Cut Shredder is 305mm and the warranty is 2 years for the machine and 20 years for the cutting blades.